It's What We Love Wednesday!! 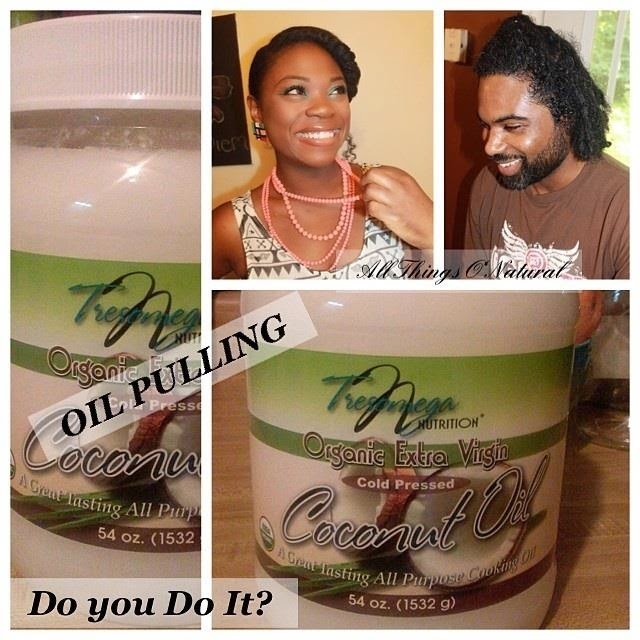 And what we are loving...OIL PULLING!! WHAT IS OIL PULLING EXACTLY..
For those who may be unfamiliar, Oil pulling is a method that's been around for thousands of years in Ayurvedic practices by East Indians, that requires the use of 1 TBSP of a natural beneficial oil (usually Coconut or Sesame Oil) and swished around in the mouth for 20 minutes which aids in pulling the toxins found in our mouth from our mouth. Recently, it's widely used as a tool for detoxification of your whole body..And as I always believe, the whole body entails mind, body and spirit. From the foods we eat, to the chemicals we put on our skin, to how we think all work together as a team to form a holistic lifestyle. Our bodies are exposed to so many toxins and it's beneficial to help minimize the toxins that we are exposed to and that attempt to remain in our bodies. Studies have shown that it reduces the issues of tooth decay, plaque and gum disease by minimizing most strains of the bacteria Streptococcus. How it works, is the fatty acid of coconut oil turns into acid, which in turn is toxic to certain bacteria. It is also known to be beneficial to destroying the yeast found in our mouths. Oil Pulling may help to lessen the overall toxic burden (as mentioned above) on your immune system by preventing the spread of these organisms from your mouth to the rest of your body. On an empty stomach and before drinking anything (so early in the morning), Take 1 TBSP of Sesame Oil or Coconut Oil (we have used both, but prefer coconut,due to it primarily consisting of lauric acid, which is an antimicrobial which aids in effectively destroying fungi, bacteria and some viruses...It also gave quicker results than the sesame oil, but be sure to test for yourself and see which works better for you) and swish around in your mouth, as if using a mouth wash, for 20 minutes (for beginners, if 20 minutes is a long time, try 10 first, but 20 minutes gives you a head start to experiencing the benefits). Be sure NOT to swallow and if you feel you may swallow, spit out and start again. After 20 minutes, spit oil out (it should be white and foamy and no longer clear, this is a sign that the oil holds toxins within). Rinse mouth thoroughly with salt water, then brush. It may seem unusual at first, but once you get used to it, you grow to love it and incorporate it into your daily routine. Newbie tip: if this is your first time oil pulling, understand that it is a detoxification process for the body as a whole. As a first time, you may experience what is called Herx Reaction, which is a reaction where you may feel worse before feeling better because your body is going through a detoxification process. It's your body's way of telling you that the fungus, bacteria, parasites and other pathogens are effectively dying off. Since our bodies are filled with so many toxins, many of which enter through the mouth and skin, once these nasties die off, your body will react. Within the first 2 weeks, I noticed my teeth appeared whiter and absolutely no bleeding from my gums. After 2 weeks, I noticed my skin clearing from any breakouts. I don't suffer with headaches, allergies or congestion, so I can't truly say on those. After 3 1/2 weeks, I noticed my breath is fresher, even in the early morning and my lips were a lot less dry. And ole dentist said, 'whatever it is you're doing, keep doing it as your teeth and gums are in great condition). For my husband, who suffers with allergies from time to time, noticed a difference in his allergies once he rekindled oil pulling. He also had a lump in his wrist that I felt was toxin buildup that went away after about a week and a half. So, while we can't vouch for all things that are claimed to become reduced, helped or healed with oil pulling, we can definitely vouch for our personal experience of ailments we may have experienced from oil pulling. We also recently introduced to our 8 year old and will introduce to our other 3 once they reach an age where they understand that you do not SWALLOW the nasty mixture..yukkers! Until next time..A Bientot! **Note: This information is not intended to diagnose, cure or heal any health illnesses. For any health issues, please consult your local practitioner.